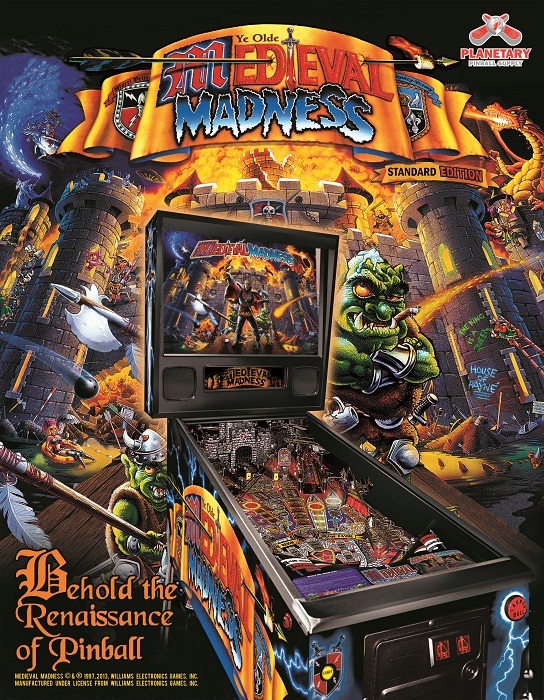 Medieval Madness remake STANDARD Edition! This is a new production of the great classic game. New electronics, looks and feels the same as original (minus some W logo and Williams labels due to WMS licensing requirements). CALL OUR MEDIEVAL MADNESS REMAKE HOTLINE 408-596-5030 IF ANY QUESTIONS! Please let us know if you are interested in a game. With this form you can pre-order as well as ask for more info. Will require $1000 deposit within 7 days check or cash to Planetary Pinball Supply, 1530 Meridian Ave Ste 102, San Jose, CA 95125 – please include , we will contact you for arrangements. We (PPS) respectfully request that the integrity and information regarding any order with us directly or any of our distributors remain confidential between the parties only, in that no detail of the order is posted on any social media outlets or public internet forum. We strongly suggest you remove any recent postings containing any order details. Failure to adhere to this request may result in the cancellation of your order and full refund of your deposit.